North Central College hosts the Chords for Kids concert, the 11th annual free concert for children with special needs and their families. 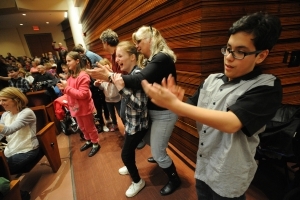 The concert begins at 7 p.m. Saturday, March 4, in Wentz Concert Hall at the Fine Arts Center, 171 E. Chicago Ave. Music and motion come together as children with special needs enjoy instrumental music. The music at the concert will range from classical pieces to popular tunes. The College's Concert Winds and Symphony Band will perform, under the direction of professor of music Lawrence Van Oyen and associate professor of music Sean Kelley. Wigglers are welcomed! Wheelchair seating is available. Admission is free, but tickets are required; call the North Central College Box Office at 630-637-SHOW (7469) or visit northcentralcollege.edu/showtix.